NAFEMS announced that Dr. Ahmed K. Noor will deliver the keynote address for the NAFMES World Congress 2012. Dr. Noor’s topic will be the implications of future adaptive systems on virtual product development. Dr. Noor is the William E. Lobeck Professor of Modeling, Simulation and Visualization Engineering at Old Dominion University. NAFEMS has issued a call for papers for their NAFEMS World Congress 2013 to be held 9-12 June 2013 in Salzburg, Austria. Abstracts are due by 5 November 2012. CFD is one of the topic areas for which abstracts are sought. 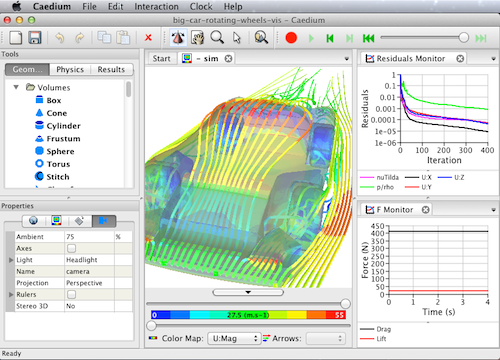 Symscape’s Caedium CFD v4 running on 64-bit Mac OS X.
Symscape provided a preview of Caedium v4 running on 64-bit Mac OS X. Beta CAE released ANSA v13.2.3. CD-adapco has updated the Dell/Intel-based HPC systems in their London office. CEI noted that they are testing EnSight on OS X Mountain Lion. CEI also updated their EnSight video gallery. DEVELOP3D includes an article about Karalit‘s pending release of an immersed boundary method CFD solver (Cartesian grid with thin, extruded, near-body layer). Flow Science published the summer 2012 issue of FLOW-3D News. ANSYS made a lot of money in 2012 Q2. Formula 1 racing teams are opting for fewer tests, possibly because of their expanded use of CFD. The National Center for Manufacturing Sciences announced a program on Simplified CFD Analysis of Tow Vehicle and Trailer Bodies whereby niche manufacturers can run CFD using OpenFOAM or ANSYS Fluent. Here’s another article about applying CFD to data center cooling. This entry was posted in Applications, Events, News and tagged Caedium, CD-adapco, CEI, EnSight, Flow Science, KARALIT, NAFEMS, Symscape. Bookmark the permalink.